By now you have undoubtedly seen a number of articles and videos from us explaining why lamp recycling is important and offering ideas on how to do it more efficiently. 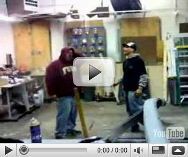 In researching for new material, we stumbled on this video clip which we couldn’t resist sharing. We can only hope that the “actors” in this clip are trained professionals and only took the time out of their busy schedules to help groups like us show what not to do with their lamps! Enjoy! If you have a small amount of CFLs or batteries, then the EasyPak Mini CFL and Battery containers are for you. These are the least expensive recycling solutions that we offer, but they have all of the same great features of larger EasyPak containers, such as recycling reports and recurring orders. Good lighting design isn't just about aesthetics- its about saving money. Many facilities don't think carefully about how they install lighting in their facilities and as a result they miss out on becoming more energy efficient. Here are some tips from the US Dept. of Energy to help you plan out your lighting systems and cut down on related costs.